OKLAHOMA CITY (Feb. 24, 2017) – Creative, layered lessons based on classic philosophical ideas are emerging to challenge students to examine the complexities of race, identity and culture through core subject areas – now with an Oklahoma twist. “The curriculum deals with bullying, self-esteem, identity, race, culture, teamwork and how to see different worldviews. Using Ellison’s short stories to create an environment where young people can discuss these complex issues moves them toward a better understanding, not just of themselves, but of the world in which they exist,” said Michael Owens, executive director of the Ralph Ellison Foundation, based in Oklahoma City. Owens said Ellison’s work is still relevant in today’s age, particularly for Oklahoma’s youth, because having the courage to take risks is something young people can identify with. “Ellison is distinctly Oklahoman. Many of his writings reach back into his childhood, not only the joy but the pain and struggle of growing up in the early 1930s and ’40s in Oklahoma City. In his life at some point he reconciles that struggle with really making him who he is as a person,” Owens said. “He shows that anyone in the most dire circumstances can achieve great things. On Feb. 28, the foundation will officially launch the “Flying Home” curriculum guide with an hour-long event at 2:40 p.m. at Douglass High School in Oklahoma City. The informative session is for all interested teachers and will include video, highlights of the guide and a panel discussion. The curriculum was developed with a grant from the Oklahoma Humanities Council and is designed for grades 9-12. LaTasha Timberlake, leader effectiveness coordinator for Oklahoma City Public Schools and a former high school English teacher, partnered with Dr. R.P. Ashanti-Alexander, principal at Lincoln Elementary School in Chickasha, to develop the curriculum over the last year. The two started analyzing Ellison’s stories by studying what the author himself had read, including articles, essays and poems. They developed discussion questions based on each of the “Flying Home” stories as well as class activities and a bibliography that includes graphic novels and videos. Timberlake said the challenge was in breaking the book down so that students could understand its themes through their own life experiences and see themselves throughout the literature. teenage girls to consider careers in science, technology, engineering and math. Its most recent project, the “Hidden Figures” Book Club, was designed to give confidence to a group of students who are underrepresented in STEM fields – girls. About 400 girls participated in the book club on their own time. Students and mentors first read the 2016 Margot Lee Shetterly book that recounts the true story of African-American women who helped NASA send astronauts to space. From December through January, students and mentors contributed to an online discussion board, which also included scholarship information, interviews with professional women in STEM and curriculum resources for teachers. 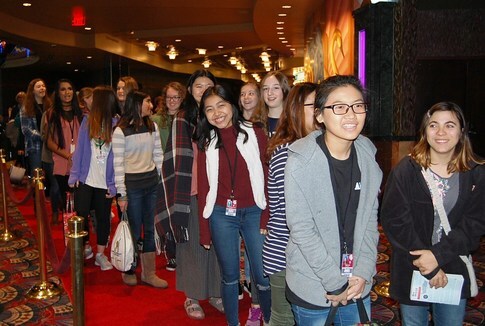 The experience culminated in the students walking the red carpet before a private screening of the Academy Award-nominated film “Hidden Figures” at the Warren Theater in Broken Arrow. Immediately after watching the movie, students were joined by a panel of STEM professionals, including retired astronaut Col. Paul Lockhart and NASA mechanical engineer Elizabeth Smith. Elise Williams, a 10th-grader at Webster High School in Tulsa, attended the screening and wants a career as either a basketball player or an aeronautical engineer. Xan Black, program director of the Tulsa Regional STEM Alliance, said the organization is pushing hard to recruit mentors that the girls can relate to. She said advancements in STEM are limited when girls are underrepresented. The book club was so successful, the alliance is sharing resources so other STEM programs across the county can replicate the event. Currently there are plans to implement it in Baltimore and five communities in California. The Oklahoma History Center is helping students identify with prominent African-Americans in the state’s history – with or without coming to the museum. Its popular traveling trunk program allows teachers to check out trunks packed with hands-on artifacts they can take back to their classrooms. Teachers check out the trunks on Saturdays and return them the following Saturday. About 25,000 students learned from the trunks in 2016. The African-American Traveling Trunk, introduced last year, has become one of its most popular. In addition to artifacts, it contains activities, trade books and glossary terms, and covers more than just history. Economics, English, math and science are among the subjects represented. Visitors to the museum can see a re-creation of the living room of Clara Luper, an Oklahoma school teacher and civil rights pioneer. Also prominently featured are exhibits on Oklahoma’s all-black towns, beauty culture and Ada Lois Sipuel Fisher, a law student from Chickasha who fought against segregation in higher education. At the beginning of March, Bessie Coleman, the first African-American woman pilot, will perform at the museum as a living history character. Danielle Calvin, director of elementary English language arts for the Oklahoma State Department of Education, said it’s important that teachers are intentional and purposeful in representing diverse aspects in their classroom, even in the youngest grades. 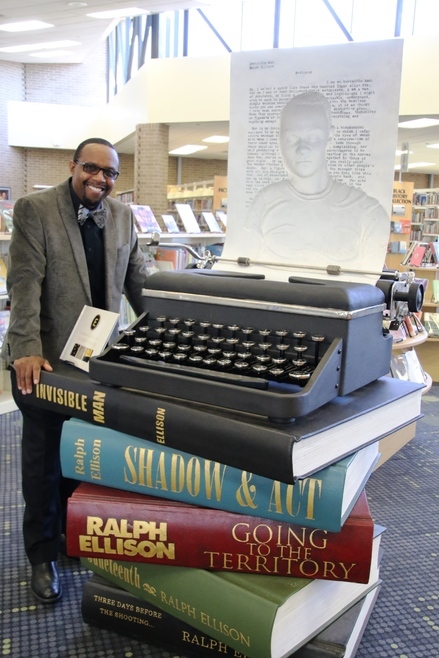 Michael Owens, executive director of the Ralph Ellison Foundation, stands with a sculpture inspired by Ellison’s works at the Ralph Ellison Library in Oklahoma City. The foundation is launching a curriculum to help students study the writer’s work, which Owens says is still relevant for today’s youth. 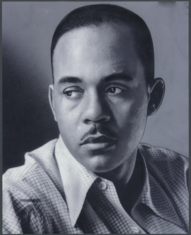 Ralph Ellison photo provided by the Oklahoma Historical Society. 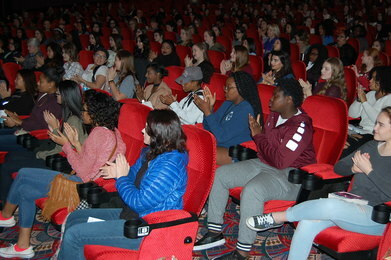 About 400 girls walked the red carpet at the Warren Theater in Broken Arrow as part of the “Hidden Figures” Book Club. The Tulsa Regional STEM Alliance started the club to give confidence to girls, who are underrepresented in STEM fields. Immediately after watching the movie, “Hidden Figures” Book Club students were joined by a panel of STEM professionals, including retired astronaut Col. Paul Lockhart and NASA mechanical engineer Elizabeth Smith. Elise Williams, a 10th-grader at Webster High School in Tulsa, poses for the paparazzi while walking the red carpet at the Warren Theater in Broken Arrow. 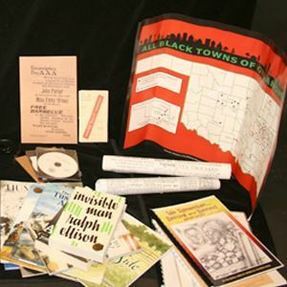 The Oklahoma History Center’s African-American Traveling Trunk contains activities, trade books and glossary terms, and covers more than just history. Photo provided by the Oklahoma Historical Society. 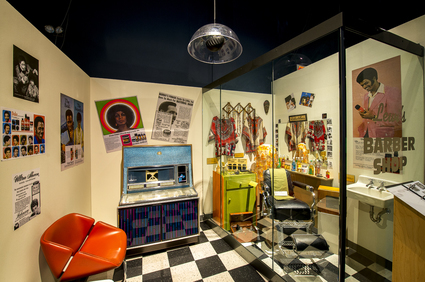 Visitors can see a variety of permanent African-American exhibits at the Oklahoma History Center, including one highlighting Oklahoma’s beauty culture. Photo provided by the Oklahoma Historical Society.